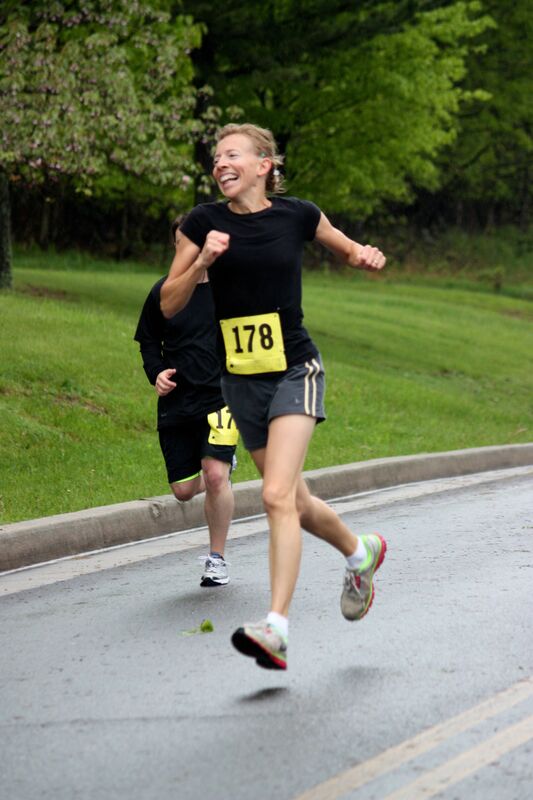 ELK GARDEN, W.Va., May 11, 2013 — From the start, it was clear the Conquer the Dam 5K title this year would come down to Joe Cross or Wes Boddy. They quickly separated themselves from the 69 other starters. Cross, 45, of Cumberland, Md., ran for the Potomac Highlands Distance Club and had two successful half marathons under his belt in the last five weeks, including an outright victory in Hagerstown in early April. He was a clear pre-race favorite. Boddy, 42, of New Creek, W.Va., followed Cross for the entire first half of the race at Jennings Randolph Lake — which featured a net elevation loss of about 230 feet in the first mile. The duo crossed the dam and neared the turn around point at the ranger station. Cross still led, and return to the near side of the dam in front. Then the hill back towards the finish began. That’s when Boddy took over. 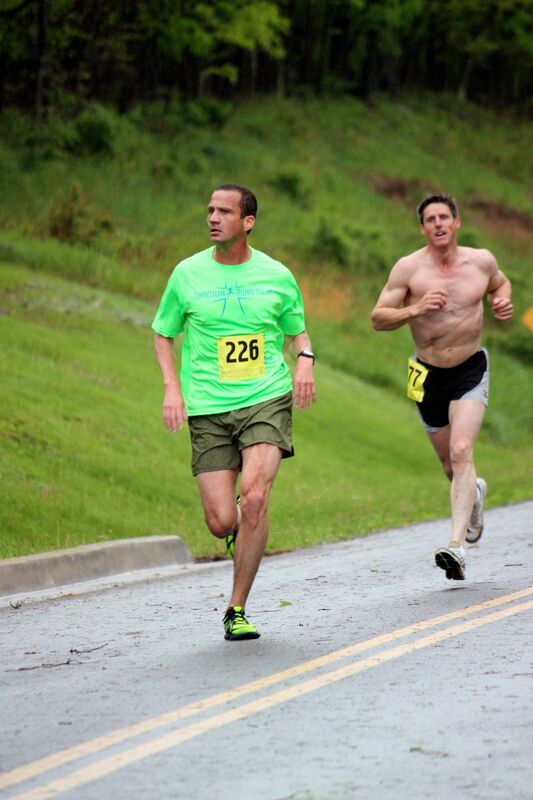 PHDC member Joe Cross leads eventual winner Wes Boddy in the first half of the Conquer the Dam 5K. Boddy raced to a course record time of 19 minutes, 36.3 seconds for the win. Cross was second in 20:23.8 while Tim Wagoner, 47, of Keyser, W.Va., placed third in 22:06.3. PHDC member Kevin Cuozzo, 38, of McHenry, Md., took fourth in 22:23 (six days after completing the Pittsburgh Marathon) and 16-year-old Jesse Wilson, of Keyser, rounded out the top five in 23:03.9. In the women’s race, Naomi Boddy defended her crown with a sixth-place finish overall (23:12.8). The gap between her finish and second place, however, was smaller this time around. 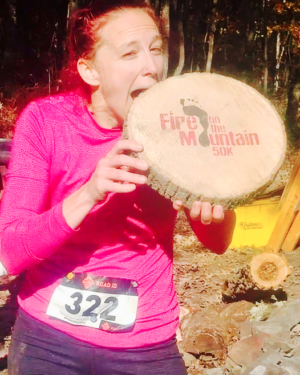 Ashley Kitzmiller, 31, of Oakland, Md., took second (and 11th overall) with a time of 25:20.1 while 15-year-old Addison Mallery, of Mount Savage, Md., earned third place in 26:56.4. Becky Brosh, 53, of Petersburg, W.Va., lowered the women’s masters record on the course by nearly a full minute to 27:53.9. The previous best was recorded in 2012 by Dara McGettigan (28:51.1). Proceeds benefitted the Aging & Family Services of Mineral County. Naomi Boddy successfully defended her Conquer the Dam 5K crown. Great race! The hill is a killer! Thanks looking forward to next year. Glad you enjoyed yourself, Becky. Congratulations on establishing the women’s masters course record. FYI – we’ve updated the spelling of your last name in the article (7:21 p.m., Saturday) and on the next results update, your last name will be spelled correctly on both the overall and age division standings as well.